Ben Nevis (Gaelic: Beinn Nibheis) is the highest mountain in the United Kingdom. It is located at the western end of the Grampian Mountains in the Lochaber area of Scotland, close to the coastal town of Fort William. The mountain attracts an estimated 100,000 visitors a year, around three-quarters of whom use the well-constructed tourist path. A large number of visitors are climbers attracted by the cliffs of the north face – among the highest in Great Britain – which harbour some classic rock climbs as well as being one of the principal locations in the UK for ice climbing. Ben Nevis's popularity, climate and complex topography contribute to a high number of mountain rescue incidents. The name Ben Nevis is usually translated as "malicious" or "venomous mountain", although some people believe Nevis to be derived from the Gaelic for "cloud" or "Heaven". It is often known simply as The Ben. Ben Nevis forms a massif with its neighbour to the north-east, Carn Mòr Dearg, to which it is linked by the Carn Mòr Dearg Arête. Both mountains are among the eight in Great Britain over 4,000 feet (1,219 metres), as are Aonach Mòr and Aonach Beag immediately to the west; the other four are all in the Cairngorms. The western and southern flanks of Ben Nevis rise steeply but relatively smoothly from Glen Nevis, with the result that the mountain presents an aspect of massive bulk on this side. To the north, in contrast, steep cliffs drop some 600 metres (2,000 feet) to Coire Leis. This corrie contains the Charles Inglis Clark Memorial Hut (known as the CIC Hut), a private climbing hut located at 680 metres above sea level, owned by the Scottish Mountaineering Club and used as a base for the many climbing routes on the mountain's north face. The steep south face of Ben Nevis from Sgurr a' Mhàim. 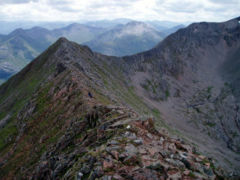 In addition to the main 1,344-metre summit, Ben Nevis has two subsidiary "tops" listed in Munro's Tables, both of which are called Carn Dearg ("red hill"). 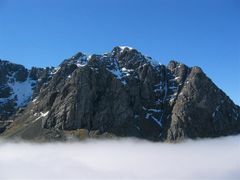 The higher of these, at 1,221 metres, is situated to the north-west, and is often mistaken for Ben Nevis itself in views from the Fort William area. The other Carn Dearg (1,020 m) juts out into Glen Nevis on the mountain's south-western side. A lower hill, Meall an t-Suidhe (711 m), is located further west, forming a saddle with Ben Nevis which contains a small loch, Lochan an t-Suidhe. 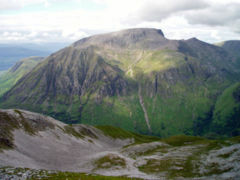 The popular tourist path from Glen Nevis skirts the side of this hill before ascending Ben Nevis's broad western flank. Ben Nevis consists mainly of igneous granite from the Devonian period (around 400 million years ago), intruded into the surrounding metamorphic schists; the intrusions take the form of a series of concentric ring dikes. The innermost of these, known as the Inner Granite, constitutes the bulk of the mountain above Lochan Meall an t-Suidhe and includes the cliffs of the north face; Meall an t-Suidhe forms part of the Outer Granite, which is redder in colour. The mountain has been extensively shaped by glaciation. Ben Nevis's altitude and maritime location frequently leads to unusually poor weather conditions which can pose a danger to ill-equipped walkers. In an average year the summit is covered by cloud (for at least part of the day) on 355 days, sees 261 full gales, and receives 4,350 millimetres (171 inches) of rainfall, compared to only 2,050 mm in nearby Fort William and about 600 mm in Inverness and London. Rainfall on Ben Nevis is about twice as high in the winter as it is in the spring and summer. 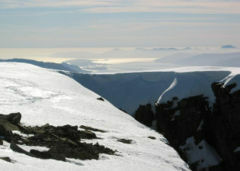 Snow can be found on the mountain all year round, particularly in the gullies of the north face. The first recorded ascent of Ben Nevis was made on 17 August 1771 by James Robertson, an Edinburgh botanist, who was in the region to collect botanical specimens. Another early ascent was in 1774 by John Williams, who provided the first account of the mountain's geological structure. A meteorological observatory on the summit was established in 1881 by Clement Lindley Wragge, who climbed the mountain daily to make readings, and permanently manned between October 1883 and October 1904. In September 1894, C.T.R. Wilson was employed for a couple of weeks as temporary relief for one of the permanent staff, during which time he witnessed a Brocken spectre. His subsequent experimental work aimed at understanding this phenomenon eventually led to his invention of the cloud chamber. The lower part of the Ben Path, maintained at a high standard to accommodate 75,000 people a year. The first path up the Ben was constructed in 1883 to service the newly constructed summit observatory. It was designed by local headmaster, Colin Livingston, cost £800, and was built to a suitable standard to allow ponies to carry up supplies. 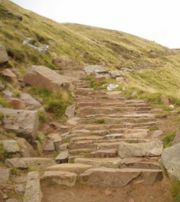 It is now known as the Ben Path, the Pony Track, or the Tourist Route, and is the simplest route of ascent. The path begins at the Glen Nevis Visitor Centre about 2 km (1.5 miles) from Fort William town centre, at around 20 metres above sea level, and a short distance up the mountain is joined by a path from the youth hostel. It climbs steeply to the saddle by Lochan Meall an t-Suidhe at 570 m, then ascends the remaining 700 metres up the stony west flank of Ben Nevis in a series of zig-zags. The path is well made and maintained throughout its length, and, thanks to the zig-zags, not unusually steep apart from in the initial stages; however, the section above the loch especially is found tedious by many who attempt it, as there is little variety in scenery. The CMD Arête from near the summit of Carn Mòr Dearg. A route popular with experienced hillwalkers starts from a few miles north-east of Fort William on the A82 road, and follows the path alongside the Allt a' Mhuilinn before ascending Carn Mòr Dearg. (It is also possible to take this route from Glen Nevis by following the tourist route as far as Lochan Meall an t-Suidhe, then descending slightly to the CIC Hut.) From Carn Mòr Dearg one continues along the Carn Mòr Dearg Arête (known as the "CMD Arête"), requiring modest scrambling ability and a head for heights, before climbing steeply to the summit of Ben Nevis; the route involves a total of 1,500 metres of ascent. This route has the advantage of giving an extensive view of the cliffs of the north face, which are not seen at all from the Tourist Route. It is also possible to climb Ben Nevis from the Nevis Gorge car park at the head of the road up Glen Nevis, either by the south-east ridge or via the summit of Carn Dearg (south-west). These routes do not require scrambling, but are shorter and steeper, and tend to be used by experienced hill walkers. The summit plateau. 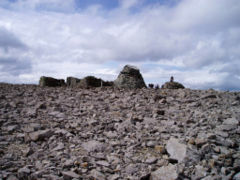 The ruined observatory is in the centre, with the summit cairn to the right. The summit of Ben Nevis comprises a large stony plateau of around 40 hectares (100 acres). The highest point is marked with a large, solidly built cairn atop which sits an Ordnance Survey trig point. The ruined walls of the observatory are a prominent feature on the summit. An emergency shelter has been built on top of the observatory tower for the benefit of those caught out by bad weather; although the base of the tower is slightly lower than the true summit of the mountain, the roof of the shelter overtops the trig point by several feet, making it the highest man-made structure in Britain. A war memorial to the dead of World War II is located next to the observatory. On 17 May 2006, a piano that had been buried under one of the cairns on the peak was uncovered by the John Muir Trust, the which owns much of the mountain. The piano was believed to have been carried for charity by removal men from Dundee over 20 years earlier. The view from Britain's highest point is extensive. In ideal conditions it can extend up to 190 km (120 miles), including such mountains as the Torridon Hills, Morven in Caithness, Lochnagar, Ben Lomond and Barra Head. In poor visibility navigating safely off the summit plateau is notoriously difficult and dangerous. The problem stems from the fact that the plateau is roughly kidney-shaped, and surrounded by cliffs on three sides; the danger is particularly accentuated when the main path is obscured by snow. Two precise compass bearings taken in succession are necessary to navigate from the summit cairn to the west flank, from where a descent can be made on the Pony Track in relative safety. In the late 1990s Lochaber Mountain Rescue Team erected two posts on the summit plateau, in order to assist walkers attempting the descent in foggy conditions. These posts were subsequently cut down by climbers, sparking widespread controversy on the ethics of such additions. Supporters of navigational aids point to the high number of accidents that occur on the mountain (between 1990 and 1995 alone there were 13 fatalities, although eight of these were due to falls while rock climbing rather than navigational error), the long tradition of placing such aids on the summit, and the potentially life-saving role they could play. However, critics argue that cairns and posts are an unnecessary man-made intrusion into the natural landscape, which create a false sense of security and could lessen mountaineers' sense of responsibility for their own safety. Carn Dearg and the north face in early April. The north face of Ben Nevis contains many classic scrambles and rock climbs, including Tower Ridge – a climb of 600 metres, not technically demanding (it is graded "Difficult") but committing and very exposed. The north face is also one of Scotland's foremost venues for winter mountaineering on snow and ice, and holds snow until quite late in the year; in a good year routes may remain in winter condition until mid-spring. Famous winter routes range from the aforementioned Tower Ridge (grade III) to Centurion (grade VIII.8). The first recorded run up Ben Nevis was on 2 August 1895. William Swan, a hairdresser and tobacconist from Fort William, ran from the old post office in 2 hours 41 minutes. In 1897, Spencer Acklom recorded a time of 2:55, and later William MacDonald from Leith improved the record to 2:27. Two months later Swan again took the record with a time of 2:20, and in 1896 MacDonald improved this to 2:18. The first competitive race was held in 1899. Ten competitors set off from the Lochiel Arms Hotel in Banavie. The winner was Hugh Kennedy, a gamekeeper at Tor Castle. The 1903 race was from Achintee and to the summit only. It was won in just over an hour by Ewen MacKenzie from Achintore, the observatory roadman. That year there was another race, from the new Fort William post office, and MacKenzie lowered the record to 2:10. Hugh Kennedy was in second place. MacKenzie's record held for 34 years. The Ben Nevis Race has been run in its current form since 1937, and now takes place on the first Saturday in September every year, with up to 500 competitors taking part. It starts from the Claggan Park football ground on the outskirts of Fort William, and the route is about four miles shorter than in the early years. The current record for men is 1 hour and 25 minutes, and 1 hour 43 minutes for women. Path to the CIC Hut alongside the Allt a' Mhuilinn. Ben Nevis's popularity and high profile have led to concerns in recent decades over the impact of humans on the fragile mountain environment. These concerns contributed to the purchase of the Ben Nevis Estate in 2000 by the John Muir Trust, a Scottish charity dedicated to the conservation of wild places. 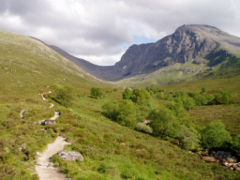 The Estate covers 1,700 hectares of land on the south side of Ben Nevis and the neighbouring mountains of Carn Mòr Dearg and Aonach Beag, including the summit of Ben Nevis. The John Muir Trust is one of nine bodies represented on the main board of the Nevis Partnership. Founded in 2003, the Partnership, which also includes representatives from local government, Glen Nevis residents and mountaineering interests, works to "guide future policies and actions to safeguard, manage and where appropriate enhance the environmental qualities and opportunities for visitor enjoyment and appreciation of the Nevis area". Its projects include path repairs and improvement and the development of strategies for visitor management. One of the Nevis Partnership's more controversial actions has concerned the large number of memorial plaques placed by individuals, especially around the summit war memorial. Many people believe that the proliferation of such plaques is inappropriate, and in August 2006 the Nevis Partnership declared an intention to eventually remove these plaques (after making efforts to return them to their owners) as part of a wider campaign to clean up the mountain. In 2005 the amount of litter on the Pony Track was highlighted by national media, including BBC Radio 5 Live. Robin Kevan, a retired social worker from mid-Wales who is known as "Rob the Rubbish" for his efforts to clean up the countryside, then drove to Ben Nevis and cleaned the mountain himself, resulting in much media coverage and a concerted clean-up effort. The Ben Nevis Distillery is a single malt whisky distillery at the foot of the mountain, located by Victoria Bridge to the north of Fort William. Founded in 1825 by John McDonald (known as "Long John"), it is one of the oldest licensed distilleries in Scotland, and is a popular visitor attraction in Fort William. The water used to make the whisky comes from the Allt a' Mhuilinn, the stream that flows from Ben Nevis's northern corrie.